Thanks to all of you who left a comment for the giveaway! This book is adorable. I just recently started embroidering and I would love to have this book. Please send me a message here with your address and I will get your book out ASAP. Enjoy!! 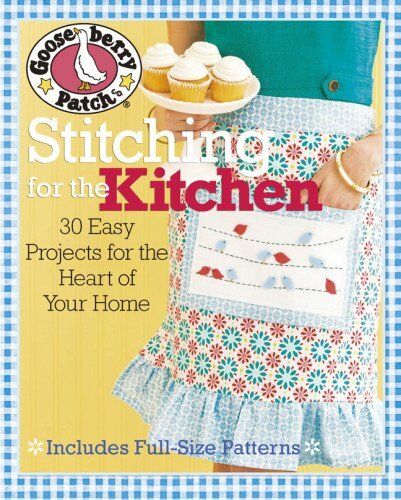 Stitching for the Kitchen Book Review and a Giveaway! This Giveaway is now closed. Thanks for your comments. The winner will be announced today! Hope you have been enjoying your summer. It has been busy here with so many things! We have enjoyed a somewhat cooler summer than what we have had the past couple of years, so we are super grateful for that. I was sent a delightful book in the mail from Sixth and Spring several weeks ago to review and share with you all. It is Gooseberry Patch's newest publication, Stitching for the Kitchen! It is packed with all sorts of wonderful projects, everything ranging from hand embroidered items to a carrying case for your sewing machine! The first thing I noticed about the book is the binding. I love the concealed spiral binding since these types of books are just so darn easy to use. I also love that the full size pattern pieces are only printed on one side so you can go ahead and just cut out what you need. Fabulous!! The instructions are well written and easy to follow, plus there are illustrations to help along the way. The book is packed with great photos that are bright and cheery. I decided to make a project from the book with some fabric I had lying around. 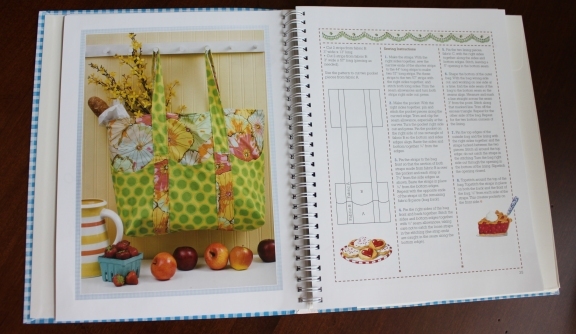 I decided to use Spring House from Moda for the handy Market Tote Bag. The construction is very simple so it goes together rather quickly. I think it would be ideal for carrying to the farmer's market or to your favorite grocery store to gather up the freshest foods for enjoying at home. Of course the beauty of using a fabric bag is that it can be used over and over again, so it is friendly to the environment. You can also just throw it into the wash whenever it needs it. I plan on folding mine up and stashing it in the car to have handy the next time I need some groceries. Because I can't help myself, I used more prints than what is called for in the pattern instructions. I had 4-5 prints from the collection and didn't really have enough of any one particular fabric to completely satisfy what was called for in the supply list, so it was a perfect opportunity to scrap this bag around a bit. Here is my result! I think it turned out quite nicely. I will definitely be taking it with me the next time I go to Whole Foods (my favorite grocery store, by far!). I didn't realize how much this bag would hold until I got ready to fill it for the photo....wow! It really does hold a lot and I like the way the handles are added. At first, I didn't really get why they continued around from one side to another as it seemed that it would be awkward to carry, but the contents do travel well with them sewn this way. I took only one other liberty with the design and added interfacing to the handles. If you want to do this, just cut 6 - 3" wide strips and add it to the wrong side of two sets of the handles (I added it to the side that would face out), then sew together. I think it makes for a sturdier handle. One other word of caution...when I was cutting out the pattern, I noticed that the pocket pattern piece said to cut 2. You really need 6, so be sure to do that. You have plenty of fabric from the requirements, so don't fret about that part. I thought that was only a minor error and one that you would easily realize once you start to make the bag...no big deal! I'll be sending a copy of this book to ONE LUCKY WINNER! All you have to do is leave a comment about why you would like to own it. PLEASE leave only one comment per person. Any additional comments from the same person will be deleted to keep this fair for everyone. The giveaway starts today and will run through Sunday, July 28th at midnight, CDT. Don't delay, leave a comment today!! If you would like to increase your chances of winning this book, don't forget to visit some of these blogs later on in the week and into next week.